I’ve been going through lots of old family photographs I haven’t seen before, and I’ve found it so interesting because something new always turns up when you least expect it. Seeing with fresh eyes means you see things that haven’t been noticed before. The photographs have been loaned to me by my cousin, Sue and I recognised one of the photographs immediately – I own a copy of it. Then I turned it over and found more information had been written on the back of my cousins print. On my photo there is a stamp from the photographer; Express Service Photographers, 2 Lincoln Court, South Street, Lancing. I had assumed this to mean the photo had been taken while they were out walking in Lancing, which would not have been unusual as Mum lived in Shoreham which is beside Lancing. 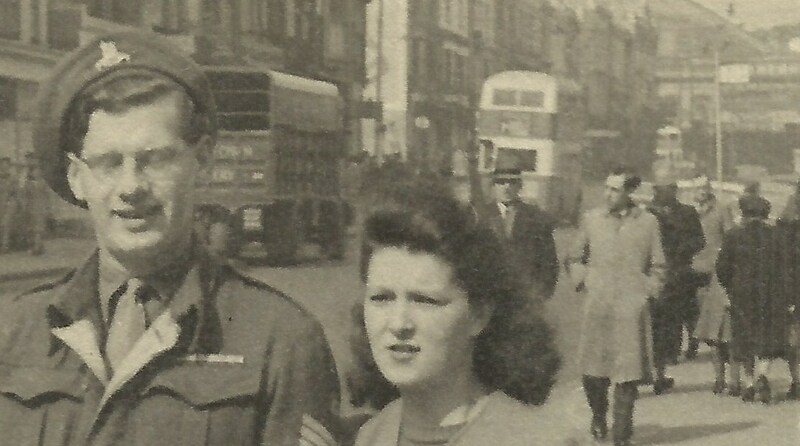 However, written on the back of my cousins print is ‘April 9th 1947; Queens Road, Brighton’. And when you look closely you can see Brighton Station at the top of the road, on the right, while they’re walking down towards the sea. 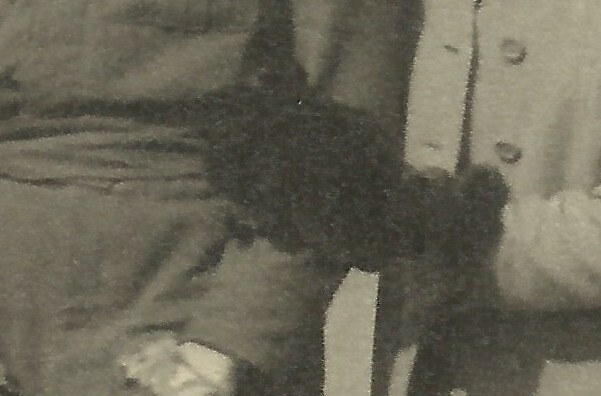 They can’t have known one another long at this time, Dad had been in Italy until September 1946. We know this because of the last letter he wrote home to his mother. They bought their engagement ring on 24 September 1947, at Saqui and Lawrence Ltd in North Street, Brighton. This street leads off from Queens Road. Maybe they were on their way to look at rings in this photo? I have the receipt for the ring, my father kept all his important papers. I also love my mother’s huge mittens, I guess it was a pretty cool spring day and there was no chance of her getting her hands chilly! The other odd coincidence is the photographer being from South Street, Lancing. My father died in South Street, Lancing in 2001. 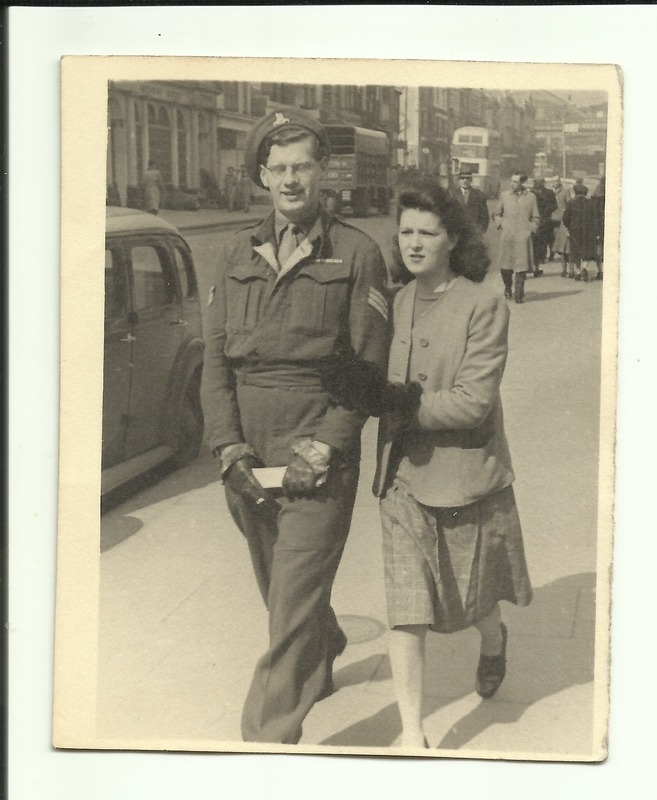 This entry was posted in Enid May Howells, Gordon Charles Dinnis, World War 2 and tagged Brighton, Lancing, Photographs, Queens Road, South Street. Bookmark the permalink. Wow! How many times have I walked down Queens Road from the station. I shall think of this photo every time I walk down there now. Nice post. I am researching these street photographs and the camerman, and took the liberty of mentioning your photo on my site in a page about the company responsible. Do let me know if this is OK before I make it ‘public’! Hello, yes this is absolutely fine thank you.